"Following up on a recommendation given to me, I contacted Furniture Works about a kitchen dilemma. My phone call was answered promptly and followed with an in-house visit by Greg Reynolds. We went over ideas and prices and the end result was a beautiful decorative shelf made of cherry, matching my cabinets perfectly. When completed, one would think that it was part of the original design of my kitchen cabinets. The work is professional and beautiful. One of a kind - Made to order. I'm passing on a valuable recommendation. If you have a problem relating to wood, don't hesitate to call Furniture Works. A very happy customer!" "Greg designed and built a custom farm table and 10 chairs for our large eat-in kitchen. We were looking for craftsmanship and individuality that you can't find in the big name furniture stores anymore, and Greg delivered. We will keep this set for a lifetime." "Quality work and great to deal with! Refinished my dressers to an amazing standard and we honestly just love them. Thank you for a job well done Greg." "Really appreciate your work. Where else could we have a custom built table made exactly as we designed it? Thanks so much for all you've done for us, the table will be handed down to our kids some day. It really is just wonderful." "Hi Greg, I just wanted you to know that my husband (and 6-year-old daughter!) are thrilled with the way you refinished the table. We all agree it looks better than ever!" "Good morning Greg, Thanks again for restoring my grandmother's hope chest. It looks better than I ever remember seeing it and it's now over a hundred years old! Really appreciate your work." "Just wanted to take a minute and thank you for the chair repairs you handled for us last week. I know it was a small job but the chairs have been in the family for two generations now and my wife is in love with them. You brought them back to life for us, can't thank you enough." "Again, thank you for the wonderful job you did on our dining room table. After twenty-five years of marriage and raising three boys, I thought the table was done for. You made it look new again, actually it looks better now than it did twenty some years ago!" "We were very impressed with the professionalism and craftsmanship of Greg and his team. Greg stained our beautiful custom wood kitchen chairs and returned several years later to touch them up. He designed and built a 10-foot wooden shelf that spans our great room. His artistry and attention to detail are evident in his work. We look forward to working with Greg on future projects." As rector of St. David's Episcopal Church in Cranbury, I have had the opportunity to work with Greg Reynolds over the past few years. Greg has designed and created items for our sanctuary including, a large wooden cross to hang over our altar, a tabernacle for the Reserved Sacrament, retables (shelves) across the back of the altar area and two credence (side) tables. Greg designed each item to suit our needs and brought his sense of beauty and reverence to his work. They fit our worship space beautifully and have made what was a very plain space into one that is quite beautiful. I highly recommend Greg and his company both for his creative design work and professional craftsmanship. I have never owned a custom-made piece of furniture and all I can say is I could not be happier that I found Furniture Works! I had been looking for a hall tree for a very long time and knew exactly what I wanted. Greg Reynolds saw my vision and created a hall tree I love and will have forever. The piece is a masterpiece and the quality went above and beyond my expectations. It is the centerpiece of our entryway and looks like it was made just for that spot. Wait, it was made just for that spot! LOL! Greg was the consummate professional and kept me updated along each step of the process with descriptions and pictures to go with it. I highly recommend Furniture Works and the amazing finished product that they will surely create. There is in Monroe township a carpentry company called Furniture Works that puts its customers, its craftsmanship and its integrity first. Greg Reynolds is, without a doubt, the most gentle person you will every meet. His craftsmanship is beyond reproach. My satisfaction with Greg, having hired him several times to work in my home, has left me 100% satisfied without ANY reservation. He is an honest man who puts pride in his work and it shows! You will NEVER go wrong if you hire him for your needs. Our experience with Greg was excellent. He is knowledgeable, professional, thorough, honest, and reliable. He promised to have our antique kitchen set refinished when we needed it. This 125-year-old set was impeccably restored to prime condition. In addition he built two leaves so that we can enlarge the table. One chair was totally destroyed and Greg repaired it. I highly recommend his services and will be using him again. Simply Amazing. I trusted a very valuable family heirloom to Mr. Reynolds and his restoration of it exceeded my expectations. The quality of his craftsmanship in the restoration was as true to the day that the piece was originally made. I cannot say enough good things about his work and very fair pricing. I would definitely recommend Furniture Works to a friend or anyone that needs exceptional woodworking done. Greg was extremely helpful and accommodating when taking care of our chairs. He recommended the type of repair and took care of it promptly and expertly. I won't hesitate to use his business in the future and highly recommend him to others! I received a rocking chair in dire need of restoration from a very special relative. It had a chipped black paint finish along with no seat attached. Greg Reynolds restored the rocking chair, added an upholstered seat and stained the wood to transform it into an outstanding piece of furniture that we will cherish forever. Greg's workmanship, professionalism and caring attitude to what we wanted to accomplish is outstanding and I would recommend him highly. Thank You Greg. I want to thank Furniture Works for the excellent job they did in fixing my two oak chairs. I will highly recommend them to my family and friends. Thank you. Greg did a great job on a console table he refinished for me. Quick turnaround and great pricing! Thanks, Greg. Happy to provide you a review, Mr. Reynolds. I'm sorry I took so long to get around to it. We are extremely happy with our new kitchen cabinets and the table and chair stripping/refinishing. Thank you for doing such a great job. We have already recommended you to my in-laws and neighbor. All the best. I had an old oak table and chairs that were in bad shape, Greg refinished them and they are absolutely gorgeous! The set looks brand-new. The service is friendly and prompt, I highly recommend Furniture Works. We bought a new refrigerator and it was too high for the space. We called Furniture Works and Greg came the next day to remove the cabinets blocking the refrigerator. He shaved the trim and reinstalled the cabinets in a few days. Great Job!!!! We recommend his service. I just had my 1930's mahogany art deco dining table refinished by Greg Reynolds at Furniture Works. Greg is very knowledgeable and taught me quite a bit about the refinishing process. His pricing was fair and the workmanship excellent. The table was picked up and delivered promptly and the new finish is gorgeous. I highly recommend this service. Highly recommend the services of Furniture Works artisans! Their professionalism, timely services, and excellent craftsmanship exceeded our expectations! We were renovating our kitchen, our cabinetry was discontinued and we needed to refit our new appliances. It was a very difficult color/design to match. Greg Reynold's expertise made for a perfect remodel. His creativity and vision offered insight into alternatives of construction to fit our everyday needs. Highly recommend to anyone looking for a custom fit and match! During our move from Colorado, the moving company broke multiple items. One being a family heirloom trunk, over 100 years old. After researching and meeting with multiple repair shops we decided to work with Greg. We are very happy with the quality of his work! He was always professional, caring and dependable. If we ever need more repairs done, he'll be the first one we call. 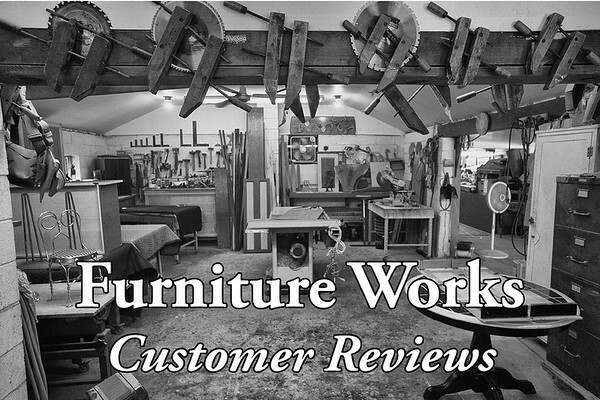 We have used Furniture Works on two separate occasions and were 100% pleased both times. The first time was to repair our kitchen chairs–the job was done quickly and for a very fair price. The most recent piece of furniture we had restored had a lot of sentimental value to our family but was in very bad condition from years of weathering. Greg came to our home and gave us an estimate and took the piece with him. A few weeks later he returned the buffet and hutch looking like new. We are very happy to recommend his service to others based on our positive experiences! I brought Greg my grandmother's old cedar chest that was in disrepair and it was refurbished beyond my expectations. It was well worth the trip from Staten Island. Absolutely LOVE the all wood dining room table owner Greg Reynolds of Furniture Works built for me! The table is exquisitely made, with particular attention to artistic detail and fine construction. It was a pleasure working with Greg and my expectation was exceeded!!! I most definitely will work with him again in the future for a new build or restoral project. Greg is an artisan! He beautifully repaired damage made by a hot coffee cup which completely took off the finish down to the bare wood! There isn't even a hint of the severe damage. I used him based on all the great reviews and am so glad I did. Thanks, again, Greg!